1. How did you first get involved in coaching? What was your path to your position as head coach of McMaster? After university, I went off to teacher’s college, and the reason was because I wanted to be able to coach, and thought that was the spot that would allow that to happen. I had a number of coaches in my life who were positive influences and I wanted to be the same thing for younger people. Elementary school was where I ended up teaching, and I always thought that being on a field or on a track would be better than in a classroom. 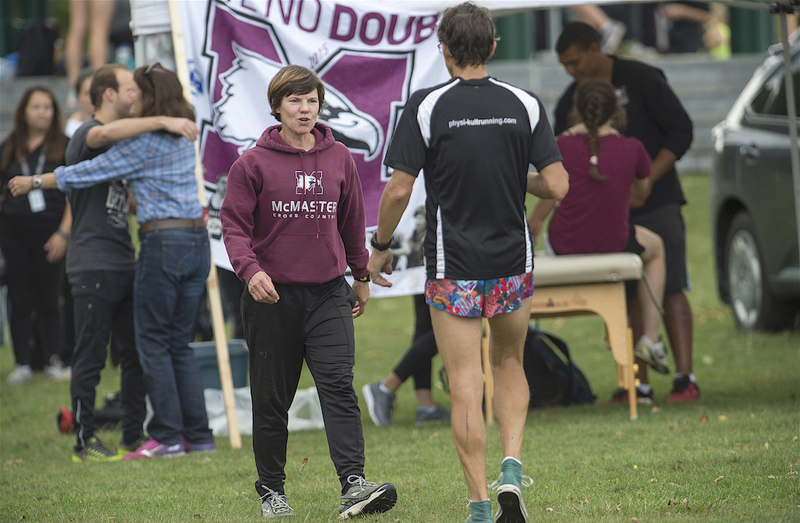 I had taught and coached for 10 years, and had helped out prior to that at McMaster as a part-time coach with cross country. So I always had my foot in the door as a coach at Mac. 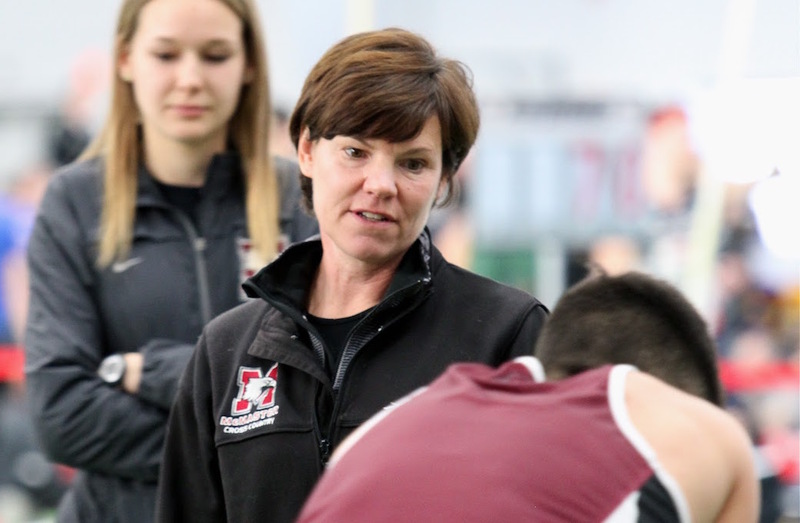 When I left teaching, I had another career path that allowed me to come back to coaching, and the opportunity to come back to Mac seemed like a great fit, because this is where it happened for me as an athlete. I was in the right place at the right time. 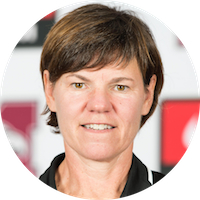 Being female, and bringing that to the coaching ranks at this level, is a good thing as well. I feel lucky to be one of those few and be a voice for women. It’s cool to be the coach of both men and women, and no one here is treated any differently because they’re male or female. As a coach now, I probably tap into the three key coaches I had over the course of my career as a runner. I had a coach until Grade 10 that I still draw upon at times, and will make decisions and think, “Is that what George Patterson would do?” The coach that I had while I was competing at Mac certainly got me to a certain level, and was more of a technical coach than I had before. My last coach, I probably draw on his coaching style more than any other. That’s Peter Grinsberg, who coached me to two Olympics and Commonwealth Games. There are many times where I’ll wonder what Pete would do, how would he change this workout, or how did he get me ready for a race? I would draw on those experiences. Every person is different, and to be treating every athlete the same would be a mistake, because people respond differently to physical stimuli, pressure situations, psychological and academic pressures. You have to be able to adjust for those and adapt on a person-to-person basis. I don’t think I have one coaching style. My approach is to be receptive to where an athlete is in their development, and figure out what type of training program works for them and how to improve on that to make them better and more successful, and help them accomplish their goals. I coach with my husband, Peter Self, and to be able to talk things through with him and share with someone who’s been there, I’ve learned a lot from him. We’re on the same page, but there are times where we differ and talk it out. 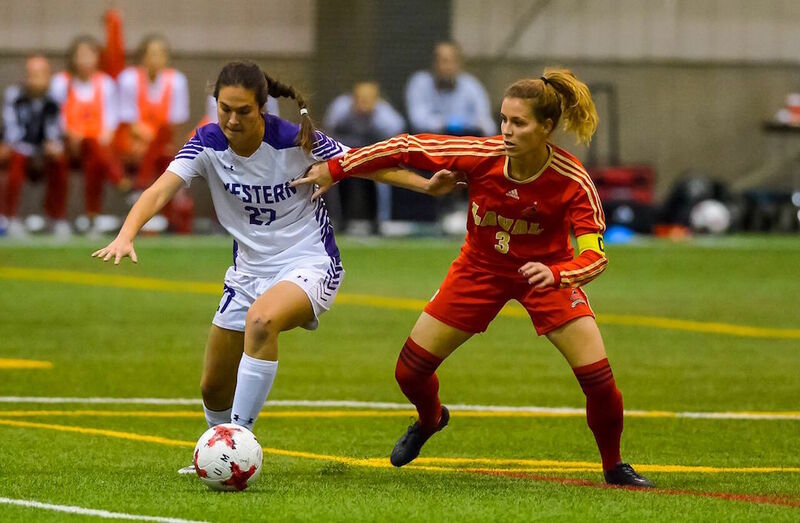 We’re always learning, and the other cool thing in the OUA is that there are a lot of other friends who we competed against or knew as coaches or athletes coming up, and we can approach them with questions. Everyone is willing to talk about it. Nothing is a secret. All coaches are dealing with the same issues, which is comforting as a coach. But this particular athlete was doubting themselves before they even left for the meet, and while they’re warming up, they’re saying, “I don’t think I can do this.” Eventually, I looked at them and said, “Here’s the race plan, and I want you to do this for me.” Which I’ve never said. But, let’s try doing this for the coach this time. It was a good outcome, and whether she was doing it for me or for her, it was a good day. But that just came out of me because I was at my wits’ end. The best thing is seeing a student-athlete grow over the years. They come in as such young, naive, under-trained deer in the headlights. I think of people like Blair Morgan or Taylor Forbes, or Taylor Reid, who were so focused and had a plan, and have reached such great success. Even Jeff Tweedle. To think that last summer, he was sixth at nationals, and he’s winning U SPORTS medals on the indoor track, to see him do that was way up there with some of the greatest moments I’ve had. The best advice is to remember that you’re doing this for you. You’re not doing it for your friends, or your parents, or anyone else. You’re doing it because you love to do it. If you can get to that place mentally, then the rest of the decisions are pretty simple. You’re doing all of the training and competing, and you just happen to have this great group around you supporting you. If you can make them happy with your results, great. But you shouldn’t be doing it for anyone but yourself. One thing that I’ve always held to is being honest. In any sport, or any thing in life, you’re going to have huge success if you have talent. You can have the hardest-working athlete, but if they don’t have the talent, then sometimes expectations get the better of them. They see the work, and think they should be winning or making certain teams or levels. You need to be honest with people, and I tell them where you think they stand. It’s not about what they’re capable of, because that can change. It’s about what they’re doing. You ran this time in this race. If you should have run faster, why didn’t you? I like to garden and hang out with and walk my dog. Those are my biggest hobbies. The dog’s getting older, but she will still be out at practice with me this year. She’s the team therapy dog. Miscounting laps is probably the biggest one. Telling an athlete that they have less laps than they do is something I’m notorious for, and some of my athletes know it. So I’ve learned just not to say anything about the laps at all.